Ah, this is what inspired today’s post. 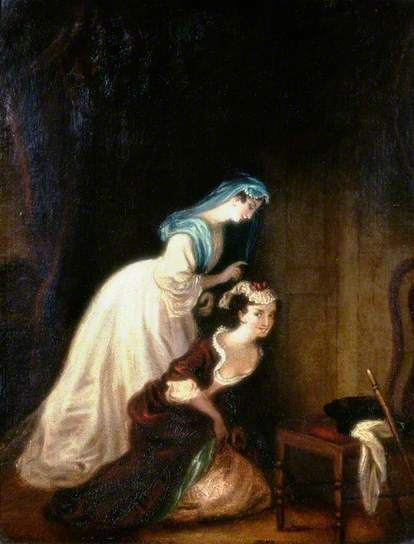 A particular favourite of mine due to the melodrama, as she is clutching her kidney or spleen or the suchlike at the shock of her beloved's infidelity. Possibly she is clutching her sherbet lemons as the object of her affections plays fast and loose with a fair-haired trollop (not that I’m over-identifying or anything). This is presumably a case of accidental eavesdropping, although it’s a bit of a coincidence to think that he just happened to be dallying with his flaxon-haired floozy at the same time as our poor girl is passing, but I think that is what is suggested. There is no doubt that these two are eavesdropping on something saucy. My reason for stating this is that firstly they are smiling, and there is a hat and cane on the chair next to them. Actually, no, shame on me. 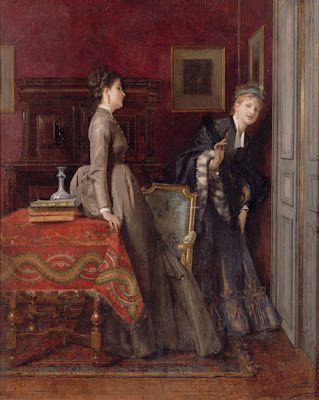 I’m sure they are eavesdropping on a visit from Madame Recoit’s solicitor and they have just overheard that they are to be remembered in a Will. Or something that isn’t about having a man rustle your bustle. 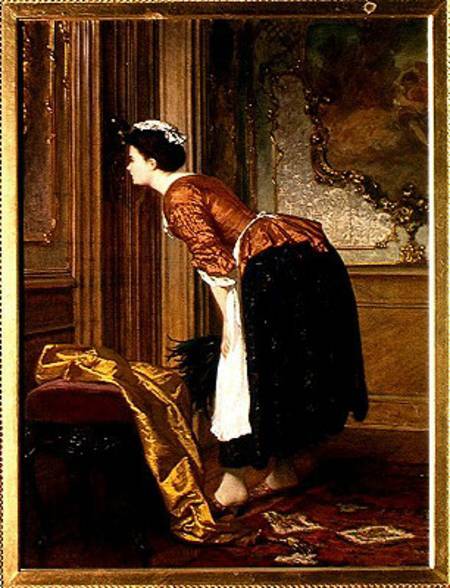 So to sum up, listening at keyholes can provide jolly entertainment in a very ‘Fanny Hill’ kind of way, but do not attempt to hear anything of any import. Well, at least not without a bag of sherbet lemons for support. 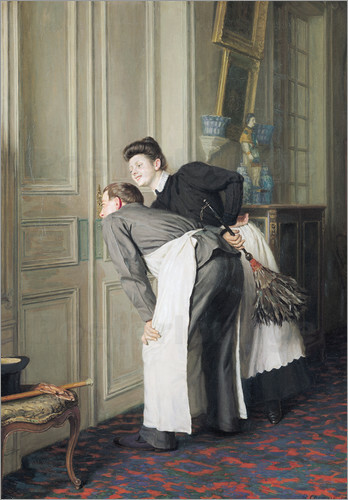 I had this sudden idea to place the two painting of people from both sides of the door together so the eavedroppers are listening to each other eavedropping (I'm not certain it's clear what I mean). It also reminds me of the part of Sam Gamgee in the movie... "I ain't be dropping no eaves..." to Gandalf after he was caught eavesdropping. Where ever did the term come from...? I think that's a lovely idea for a pair of paintings. Now I want something saucy in the middle, for a Gossip Triptych. An Etty, maybe? Apparently it refers to someone who stands in the eaves drop, or just outside a door, under the eaves, and listens. Or what people did for entertainment in the days before Twitter. I am a lurker and , even worse, a former French teacher ! I love your blog so thanks for keeping me entertained, educated, amused and delighted. 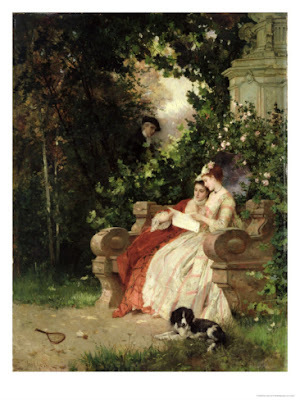 Keep these sumptuous paintings coming. Oz The Great and Powerful - Is it Just Me?